Huntley High School senior Taylor Wendt logged the only perfect score out of 108 exams at the Illinois Drafting Educators Association (IDEA) Regional held at McHenry County College in March. 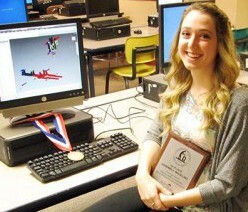 She placed first among 30 students who took the 3-D Assembly exam, which focuses on using Autodesk Inventor 3-D software. Wendt will now travel to Illinois State University for the state-level test on April 11. She plans to study mechanical engineering at either Purdue University or Bradley University next year. The Illinois Drafting Educators Association is an Illinois not-for-profit professional education organization with a mission of advancing the drafting occupation through better education.